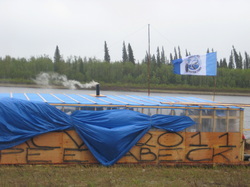 The raft from Fort Albany First Nation was joined by 2 rafts from Constance Lake First Nation. They departed Saturday May 28 at 2:20. They encountered obstacles on their journey as the raft got stuck. They participated in traditional activities.